As I mentioned before, I have been wanting a turning compost bin for awhile now. So last weekend, my husband made me one! He used a combination of scrap wood and some new plywood to make me a box perched on a v-shaped stand. 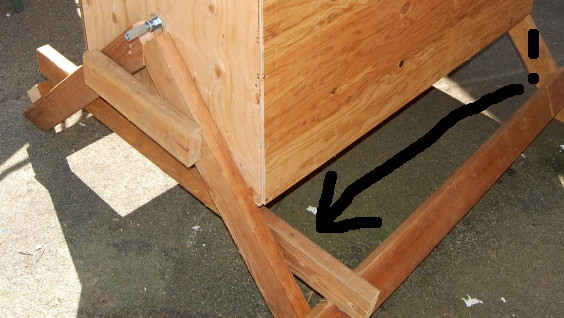 It has a “brake” in the form of a piece of wood along the base. When you pull it out, the weight of the box rotates the bin for you. On the top is a wide door that we can open to throw the waste in. There’s a lot of room in there. Because my husband was using wood, he water-proofed it with a deck stain to keep rot from eating away at the wood. The whole thing cost $18. A rotating compost bin this size in the store would cost over $300–at least that’s what I saw when I shopped around. 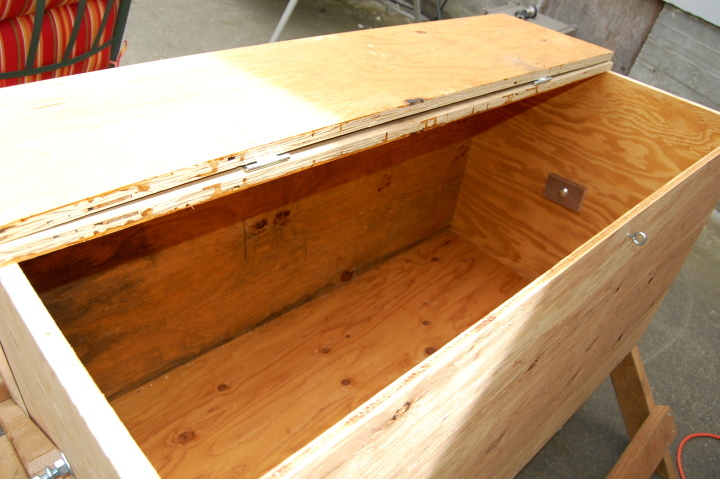 ETA: Since wood rots, paint the inside of the bin to keep it from breaking down. It will double the life of the bin. ETA 2: Sorry, I can’t provide specs for this bin at this time. Maybe in the future! I ordered one a couple of weeks ago and it should be arriving soon. It was more than $18, but less than $300. Question: I remember reading that seeds should not go in the compost bin. That makes sense to me. Does that mean that strawberries and other things packed full of seeds should not go in? If I have a bad orange or apple, do I have to cut it up and get the seeds out first? Oh yeah, I just said $300 because that is the price that I have seen–they may very well be less if you shop around. I did see one for $100, but it was a lot smaller than mine. I’m not sure about seeds since I’m so new to composting. I would guess that one or two wouldn’t make too big of a difference, but that’s a good question! Wish I had a hubby who’d make me one of those. Lucky you. Re: seeds. I don’t worry about them and certainly put strawberries and apple cores in my compost. The only problem I’ve ever had (if you consider it a problem) is butternut squash seeds sprouting. Re: rotating composters. There are plenty for under $200. Yes it’s more than $18. Just depends on whether you have the time and the skill to build one. I will talk to my husband and try to get back to you with it asap. I would like to build one similar as well. Can you share dimensions and any improvement suggestions. Thanks. Hi! I ran across this and love the idea! I too would like to know the materials he used to build? I’m doing it by mself and need to do it soon to move my current pile on the ground. Thanks so much! I would also like to build one. Along with dimensions could you give some basic instructions, especially how the brake works. Thanks in advance. I would be so excited to have an option I could afford. I searched for a wood composter and yours came up. I would love for my hubby to make one, can you share the instructions & dimensions with me too? We had a “Wood tools” Christmas and this will be a great project for my hubby to work on. That’s a very handsome bin! Jealous! Wanted to comment on seeds. My understanding is that the heat generated by the compost will basically kill the seed… if the compost is generating the proper heat. 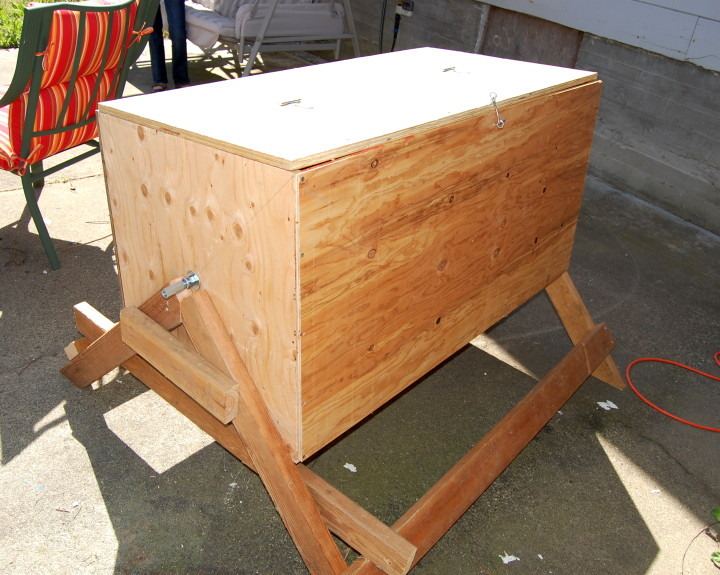 I ran across your wood composter after searching online looking for something exactly like this and yours was the only one I could find that didn’t use plastic. Have you had any difficulty rotating it? This project looks like something I could build with my limited carpentry skills and basic tools. If you would be so kind, if you already have prepared a list of the dimensions, parts and basic assembly instructions for the others that requested it, could you please forward a copy to me too? I worm compost kitchen scraps and my worm population has exploded and I don’t have enough scraps to feed them so now I need to start precomposting leaves and other yard waste to feed them. In return they provide me with some of the best organic fertilizer – their worm poop! I love this compost bin and would like to make one for my garden. Can you also provide me with the dimensions, supply list and instructions to make it? 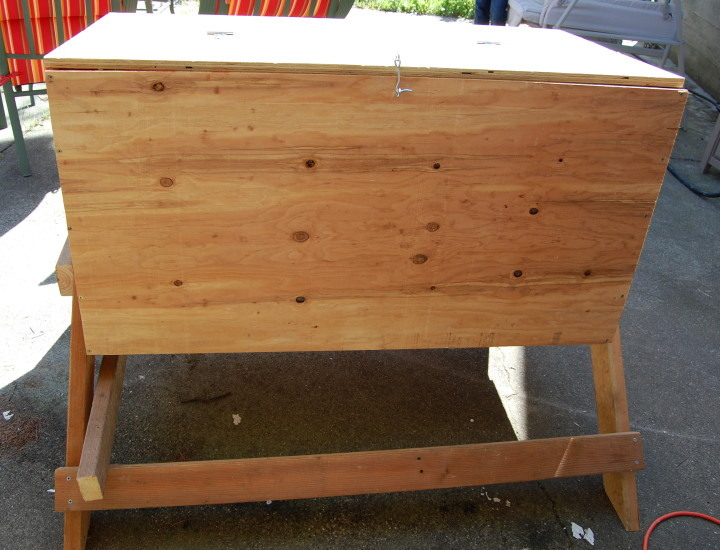 This is such a perfect DIY rotating compost bin! How has it held up over the years? If you could share the dimensions, supply list, and instructions to make it I would appreciate it a ton. Thanks so much.